A Year of Being Here: Ruth L. Schwartz: "Tangerine"
we can’t stop it either. We breathe in. "Tangerine" by Ruth L. Schwartz, from Dear Good Naked Morning. © Autumn House Press, 2005. 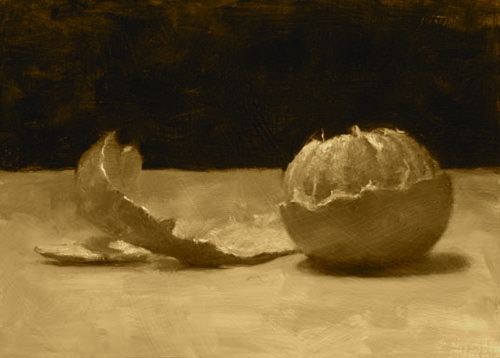 Image credit: "Peeled Tangerine," oil painting by Justin Clayton, 2005 (originally color). I love this poem--and the whole project. It's a treat, both to be reminded of so many poems I love and use in my work and to discover new mindful poems. Thank you for doing this! Thank you again for a wonderful site--supporting a rich practice!